Is limistéar mara é an Kattegat (An Danmhairgis, ón Olainnis, a úsáidtear go coitianta i mBéarla), nó Kattegatt (An tSualainnis) ar cósta thiar theas leithnis na hIútlainne agus Oileán Caolas na Danmhairge agus ar cósta thoir na réigiúin Västergötland, Scania, Halland agus Bohuslän na Sualainne. Draenálann an Mhuir Bhailt isteach sa Kattegat tríd an Øresund agus Caolas na Danmhairge. Is píosa leanúna den Skagerrak é an Kattegat agus d'fheadfaí féachaint air mar chuan den Mhuir Bhailt nó mar chuan den Mhuir Thuaidh, nó ní mar chuan ar chor ar bith sa ghnáthúsáid Lochlannach. Dar leis an sainmhíniú a bunaíodh le coinbhinsiún i 1932, a bhí sínithe ag an Danmhairg, ag an Iorua agus ag an tSualainn (cláraithe ag Sraith Conartha Conradh na Náisiún 199 - 1933) tá an teorann thuaidh idir Kattegat agus Skaggerak suite ag an bpointe thuaidh den Skagen ar Iútlainn agus tá teorann theas i dtreo Oresund suite ag barr na leithinse Kullen i Scania. Is iad na huiscebhealaí a draenálann isteach sa Kattegat ná na habhainn Göta älv ag Gothenburg, chomh maith leis an Lagan, Nissan, Ätran agus Viskan, ón réigiún Halland ar an taobh Sualannach agus an abhann Gudenå ón Iútlann, sa Danmhairg. Is iad príomhoileáin an Kattegat ná Samsø, Læsø agus Anholt, agus tugtar 'crios fásaigh na Danmhairge' ar an dá ceann deireanach den oileáin seo, de bharr a n-aeráid thirim shamhraidh. Tá roinnt limistéir cósta suntasacha buailte leis an Kattegat, lena n-áirítear anaclann dúlra Kullaberg i Scania na Sualainne ina bhfaightear roinnt speicis neamhchoitianta agus cladach carraigeach, baile Mölle, ina bhfuil cuan pictiúrtha agus radhairc do Kullenburg agus do Skagen, ar bharr thuaidh na Danmhairge ann. Faoi láthair, tá droichead beartaithe idir an Iútlainn agus an tSéalainn trasna an pointe deisceartach an Kattegat faoi dáil polaitíochta sa Danmhairg, ag nascadh oileán Séalainne agus oileán Samsø le mór-roinne na Danmhairge. Ar an Thuaidh Líne a cheanglaíonn Skagen (An Scáth, Pointe Thuaidh na Danmhairge) agus Loch Shlabhrach Skær (57°54′N 11°27′E) agus ansin go thoir thuaidh tríd na hoitreacha chuig Oileán Tjörn. * Sa Chrios Beag Líne a cheanglaíonn Falshöft (54°47′N 9°57.5′E) agus Vejsnæs Nakke (Ærö: 54°49′N 10°26′E). * Sa Chrios Mór Líne a cheanglaíonn Gulstav (Pointe fíordheisceartach Oileán Langeland) agus Kappel Kirke (54°46′N 11°01′E) ar oileán Laaland. 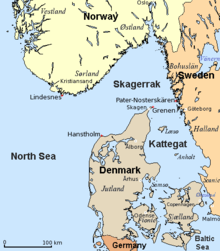 * Sa Sound Líne a cheanglaíonn teach solais Stevns (55°17′N 12°27′E) agus Pointe Falsterbo (55°23′N 12°49′E). Dar le Den Store Danske Encyklopædi agus Nudansk Ordbog, tagann an t-ainm ón na focail Ollainnise kat (cat) agus gat (poll, geata). Déanann sé tagairt do bhéarlagair loingseoireacht meanaoiseacha, nuair a dhéanadh captaein na loingeas trádala Hanseatic comparáid idir Caolais na Danmhairge agus poll chomh chaol go mbeadh deacracht ag cat é féin a chúngú tríd de bharr na scairbheacha agus an uisce thanaí. Ag pointe amháin sa stair, ní raibh ach fad de 3.84 ciliméadar (2.39 mí) ar leithead d'uisce taistealaithe. Tá an brí céanna ag sráid Kattesundet an Chóbanhávan, i., pasáite caol. Ba iad An Mhuir Ioruach agus Muir na hIútlainne na hainmneacha a bhí ann roimhe sin do Skagerrak agus Kattegat in éineacht. (Luaitear "Muir na hIútlainne" i sága Knýtlinga.) B'aimn ársa na Laidine an Kattegat ná Sinus Codanus. Ceann de na céad marbhcriosanna mara a cuireadh faoi ndeara sna 1970s ab ea é, nuair a cuireadh tús le taighde faoi thionchar dian-usáid eacnamaíochta ar an dúlra. ↑ Convention No 3210. League of Nations Treaty Series 199, 1933. Retrieved 15 April 2008. Tugadh an leathanach seo cothrom le dáta an 26 Lúnasa 2015 ag 12:33.